Hello and happy weekend! Thanks to everyone who visited my virtual "sample/garage" sale! In my book, it was a total success and I'm thrilled to see my babies going to good homes. We had a recycled leather cuff tutorial on Tuesday that just HAPPENED to turn into a surprise giveaway - did you visit? There's still time as it ends Sunday night. Wednesday's Earth Shattering, Life or Death Question dealt with how other famous designers copy my design ideas. Okay, pick yourself up off the floor. It's not that funny! We're talking "in theory" people! Thursday's Featuring Studio Spaces was with Patty Gasparino. If you missed it, I strongly URGE you to head over. Otherwise, you would miss a terribly inspiring creative space. 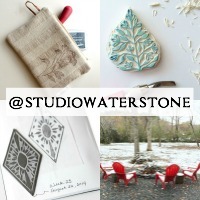 and here's what happened this week at Studio Waterstone. I had four leather handbags that I'd hoped would be finished by tonight. But alas, I'm pooped and Lifetime is having a Project Runway marathon - it's all about priorities! Have a great Saturday and I hope you'll join me with your macro on Sunday.